Saint Anthony (Putilov) was born on March 9, 1795 in the town of Romanov in the Yaroslavl province, and was baptized with the name Alexander. His siblings were called Timothy, Jonah, Basil, Cyril, and Anysia. 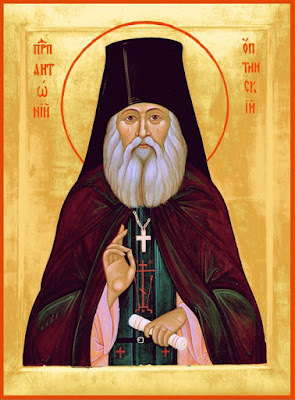 John Putilov named all his children after the saint commemorated on the eighth day after their birth, so the future Saint Anthony was named for the holy hieromartyr Alexander the Bishop of Rome (March 16). The children were educated at home, since their parents feared they would be corrupted in some way if they were sent away to school. From an early age, Alexander was quiet and modest, disdaining the noisy games of other children. It is not surprising that he should be inclined toward monasticism even as a child, because his great-grandfather Joel had been a hierodeacon at the Serpukhov Monastery, and his cousin Maximilla was a nun in the Annunciation women’s monastery in Moscow. When Alexander was ten years old, his brothers Timothy and Jonah entered the Sarov Monastery. They wrote to him and sent him spiritual books, which he enjoyed reading. When he was only thirteen, he wrote to them expressing the wish to become a monk like them. The young Alexander endured many trials and illnesses during his childhood, and on ten separate occasions he was in danger of losing his life. Once he nearly drowned, another time he fell and fractured his skull. He had several other close calls, yet God spared his life, forseeing something better for him (Hebrews 11:40). After his father’s death in 1809, Alexander went to work for the merchant Karpishev in Moscow, for whom his older brothers had also worked. He lived in Moscow only three years, but he remembered the location of all the city’s holy places and wonderworking icons for the rest of his life. On September 2, 1812, he tried to flee Moscow during Napoleon’s invasion, but it was too late to escape. A Pole on horseback pointed a pistol at Alexander and stole his money. Later, French soldiers robbed him of his watch and most of his clothing, and held him prisoner for ten days. During his captivity he consoled himself with the words of Saint John Chrysostom, who said that the worst sufferings on earth are nothing compared to the least sufferings in hell. After learning that there were Russian soldiers outside of Moscow, Alexander escaped on September 12 while it was raining. He found a group of Russians, including some of his relatives. They walked through forests and swamps by night, and hid from the French by day. Eventually, Alexander arrived at the home of some relatives in Rostov. Not knowing what had become of his brothers, he took a job similar to the one he had in Moscow. Alexander loved to visit the Saint James Monastery in Rostov, where the relics of Saint Demetrius of Rostov (October 28) were enshrined. By the end of 1815, circumstances finally permitted him to withdraw from the world. First, however, he arranged for his older brother Basil to marry, choosing a suitable and pious bride for him. At the end of 1815, Alexander went to Moscow to visit the various churches and monasteries. He prayed to the Most Holy Theotokos and to all the saints, asking that his intention to become a monk might be blessed. From Moscow, he traveled to Kaluga, and then to the Roslavl forests in Smolensk province where his brother Father Moses had been living for about five years. Alexander consulted with his brother about his desire to enter the monastery at Sarov, and decided to remain with Father Moses until spring. He was made a novice on January 15, 1816. In the spring, Alexander decided he would remain a while longer. Several months later, he went with Father Moses on pilgrimage to Kiev. On their return trip the brothers stopped at several monasteries, conversing with many Elders about the spiritual life. Alexander was not inclined to enter any of them, however. Back in the Roslavl forests, Alexander realized that he did not want to leave his brother. He had come only for a brief visit, but ended up staying with Father Moses for the next twenty-four years. Despite the many illnesses of his childhood, Alexander was blessed with great physical strength, and devoted himself to seemingly impossible ascetic labors. The brothers would get up at midnight and read through the cycle of services without omissions, and so Alexander became familiar with the church Typikon. He copied out patristic texts by hand, and helped his brother compile extracts from various sources in order to provide a system of rules for the Christian life. Out of reverence for these spiritual books, the brothers remained standing when they read or copied them. Alexander spent so much time standing on his feet that he damaged his legs, which caused him pain for the rest of his life. As the youngest member of the community, Alexander had to get up before the others in order to wake them. He chopped wood, carried water, worked in the vegetable garden, and still fulfilled his daily rule of prayer. After a trial period of four years, Alexander was tonsured by Father Athanasius on February 2, 1820 and was given the name Anthony. He was also placed under the spiritual guidance of Father Moses. In 1821 Bishop Philaret of Kaluga (later Metropolitan of Kiev) decided to establish a skete at Optina Monastery for experienced ascetics who wished to live in silence. He had met Father Moses at Optina in 1820 where they were introduced by Igumen Daniel. The bishop offered him the opportunity to move to his diocese and establish a skete at Optina, and Father Moses accepted. On June 3, 1821 Father Moses left the Roslavl forests with Father Anthony, and the monks Hilarion and Sabbatius. The Elders Athanasius and Dorotheus decided to remain behind until the skete was completely ready. For the rest of his life Father Anthony would always remember his five years in the Roslavl forests with a special joy. On June 6 Saint Anthony arrived at Optina with the other monks. The site they selected for the skete was 400 yards from the monastery’s eastern side. They cleared the land of trees and built a cell and a church dedicated to Saint John the Baptist. Saint Moses was appointed igumen, and on August 24, 1823 Anthony was ordained as a deacon. Saint Anthony was placed in charge of the skete when his brother was made Superior of Optina Monastery in 1825. For the next fourteen years the skete flourished under Anthony. Wise Elders and experienced ascetics were attracted to the hesychast skete by the fame of Father Moses. Saint Leonid (October 11) came from the Saint Anthony of Svir monastery with five of his disciples in 1829. Saint Macarius (September 7) came from Ploschansk monastery in 1834 at the invitation of Father Moses. With the help of Father Leonid and Father Macarius, Father Moses and Father Anthony introduced the ancient monastic tradition of eldership at the skete and monastery. Saint Anthony was an example of obedience to others. Though he was Superior of the skete, he never made any decisions or gave any orders without the blessing of his own Elder, Father Moses. At first, life in the skete was very difficult. There were not enough monks to do all the work, so Father Anthony carried his own water and firewood. He also worked on the grounds, cleared paths, took his turn serving in church, and greeted visitors. The hard work made him appreciate the simple food served in the trapeza. Sometimes a benefactor would donate wheat loaves for the brethren, but most days they ate black bread. Father Anthony suffered from various afflictions throughout his life. His legs pained him because of his continual standing. He also had eye trouble, and even lost his sight for a brief time. In 1836, while hurrying to the monastery along a forest path for the midnight paschal service, Father Anthony stubbed his right foot on a tree stump. His legs were already sore from years of standing, and now they developed open sores.The inflammation in his legs prevented him from leaving his cell for six months. He bore all these trials with patience and humility, believing that illness is sometimes given to us by God in order to heal the infirmities of the soul. When anything unpleasant happened to him, he remained meek and calm. He offered thanks to God because his sickness gave him more time for reading spiritual books for the benefit of his soul. On November 30, 1839 Bishop Nicholas of Kaluga summoned Father Anthony, and appointed him as igumen of the Maloyaroslavets Monastery. He had hoped to remain at the skete for the rest of his lfe, but in spite of his sorrow at leaving Optina, he went obediently to his new assignment. By the mercy of God, three Putilov brothers were now serving as igumens of monasteries: Moses at Optina, Anthony at Maloyaroslavets, and Isaiah at Sarov. Father Moses seemed to have the least difficulty in bearing the sorrows and labors of his office. The others sometimes found it difficult to fulfill their duties and provide for the needs of the monastery. After five years in the forest and eighteen years at the skete, Father Anthony found life at Maloyaroslavets monastery like living in the midst of a noisy city. The monks did not share the same oneness of mind as the Optina monks. Besides this, Father Anthony was so ill that he was not able to observe what was going on in the monastery, and he had to issue his orders through others. After only a few days he became depressed at his situation. One night Saint Metrophanes of Voronezh (November 23) appeared to him in a dream and blessed him. He said, “You have been in Paradise and you know it. Now work, pray, and don’t be lazy.” From that time, Father Anthony felt himself to be under the saint’s special care. Father Anthony zealously devoted himself to improving the spiritual life of the monastery, but he was not happy there. More than once he wrote to the bishop and asked to be allowed to retire. The bishop, however, would not hear of it. Father Anthony also wrote to Father Moses to express his sorrow and his desire to be relieved of his duties. Father Moses told him that he could not abandon his responsibilities, for that would insult the monastery, and would also grieve the bishop and Father Moses himself. He chastised his brother, saying that in seeking deliverance from his sorrows, Anthony was placing his own will in opposition to the will of God. Father Anthony accepted the rebuke of Father Moses and learned to bear his cross with meekness, and to place all his trust in God. 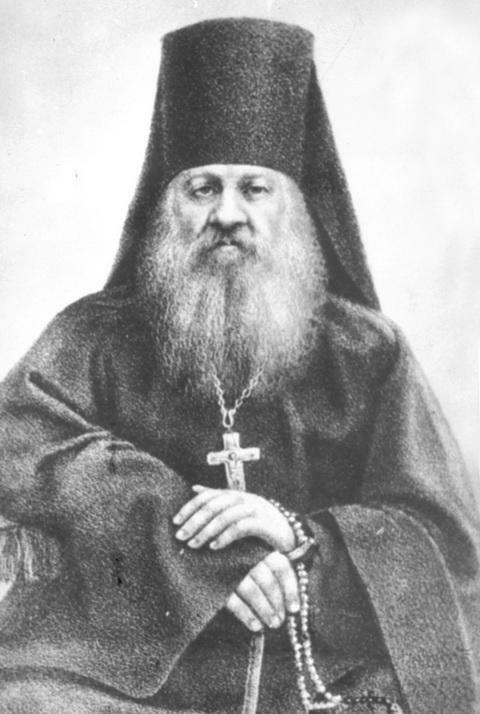 Finally, in 1853, Bishop Gregory of Kaluga relieved Father Anthony of his duties, and permitted him to retire to Optina. Father Anthony arrived back at his beloved Optina on February 12, 1853, and was given a cell near Father Moses. Although he continued to suffer from physical ailments, he bore them with exemplary patience. He went to church for all the services, and took his meals with the brethren. Since he continued his prolonged standing, his legs became covered with sores. The writer I.V. Kieryevsky told Father Anthony that he fulfilled the words of Scripture: “Whom the Lord loves, He chastises” (Hebrews 12:6). Father Anthony retorted, “Many are the scourges of the sinner” (Psalm 31/32:10). He never complained about his sufferings, even though they prevented him from leaving his cell for weeks at a time. If he could not be at the church services, he would read his rule of prayer in his cell at the very time the services were taking place. Only those experienced in the spiritual life themselves could understand what spiritual gifts God had granted Father Anthony, which he tried to conceal from everyone. There is reason to believe that he saw visions, and attained great spiritual heights. When he was serving the Liturgy, his face seemed to radiate such grace that those who merely looked at him felt that their souls were transformed. After services in the church and prayers in his cell, Father Anthony devoted himself to his favorite occupation—reading. He loved the Holy Scriptures and the writings of the Fathers, and also enjoyed other books of a spiritual or historical nature. He gave over 2,000 of his books to the monastery library, and he had read every single one. He made notes on what he read, and also copied excerpts from books and magazines for the benefit of his spiritual children. The Elder was blessed with a remarkable memory. Not only could he remember everything he had read for many years afterward, he also remembered who had visited him on a particular day, and what their conversation had been about. Saint Anthony knew how to balance strictness with a certain amount of compassion for human weakness. He would not bless anyone to depart from the Church’s norms, however. He was very strict concerning spiritual matters in general, and especially the teachings and canons of the Church. He himself believed in the Church’s teachings and kept its precepts, and he required the same faith and obedience from his spiritual children. Father Anthony’s retirement at Optina lasted for twelve years. When Father Moses reposed in 1862, Father Anthony was stricken with grief. For the first forty days he secluded himself in his cell, constantly reading the Psalter for his newly-departed brother. For about a year, he avoided people as much as he could, and prayed for Father Moses. He refused to speak to anyone about the hidden spiritual life of Father Moses, but he did reveal to a few people that he remained in spiritual contact with his brother even after his death. In 1863, Father Anthony went on a pilgrimage to venerate the relics of the newly-glorified Saint Tikhon of Zadonsk (August 13) and Saint Metrophanes of Voronezh. He also visited several other monasteries, and some families who loved him. Upon returning to Optina, Father Anthony began to prepare for his departure from this world, and on March 9, 1865, at the age of seventy, he received the Great Schema. On June 24, 1865, the Nativity of Saint John the Baptist and the Skete’s Feast Day, Igumen Anthony attended Liturgy in the skete church for the last time. He was growing weaker day by day, and in July he began to suffer from typhoid fever. As a result, he was able to sleep only for brief periods.Still, he continued to receive visitors, giving advice and instructions, and revealing to some that he was about to die. Saint Anthony was not afraid of death, but awaited it in a spirit of joy and peace, surrendering himself to the will of God. He asked that his schema and the other garments in which he wanted to be buried be laid out and ready. He also started distributing his belongings to others as a remembrance. After Liturgy on August 6, some of the brethren came to his cell to sing the troparion and kontakion for the Transfiguration. The next day he asked to be clothed in the full garb of a schemamonk. Due to his weakness, however, this could not be done. They placed the schema over him, and that satisfied him. That evening Saint Anthony asked to see the Superior, and sought his blessing for his final journey. Father Isaac blessed him and took leave of him. Then the Elder asked Father Isaac to ring the bell three times. In monasteries this is normally done after someone has died, so his request seemed rather unusual. However, in 1863 Saint Anthony had compiled a collection of prayers for those who were incurably ill, with prayers for the departed. In this collection he stipulated that the bell be rung three or more times “to announce to the brethren that the sick brother is departing” so that they might pray for him. The Canon for the Departure of a Soul was read for him, and when it was completed he lay silent for a while. Suddenly he looked to the right and to the left in a threatening manner, and even raised his left fist. Those present became fearful, for they believed that he saw something which their eyes could not see. Perhaps they recalled that many of the saints had seen demons just before they died. One of the spiritual Fathers of the monastery blessed him three times with a hand cross. The holy Elder sighed three times, then departed to the Lord. The funeral took place on August 10, and was attended by many people. 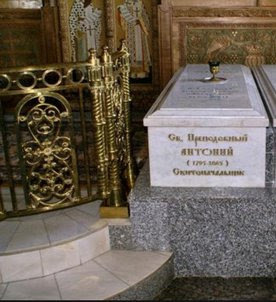 Although Saint Anthony wanted to be buried in the new cemetery, the Archishop ordered that he be buried next to his brother Saint Moses in the side altar of the monastery’s Cathedral (katholikon).